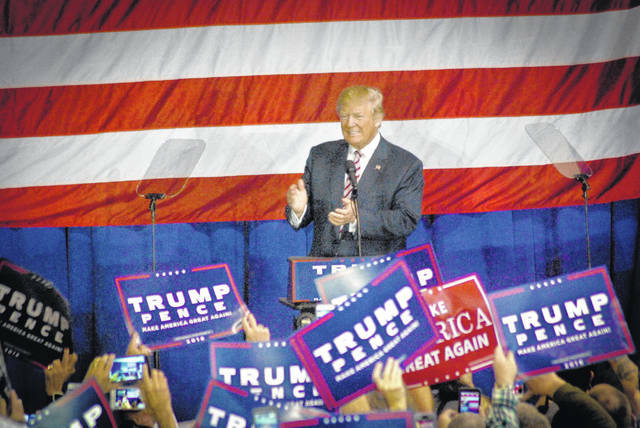 Before and after GOP presidential candidate nominee Donald Trump stepped to and from the Delaware County Fairgrounds Coliseum stage in October 2016, supporters were cheering and waving his signs in support of his candidacy for president of the U.S. 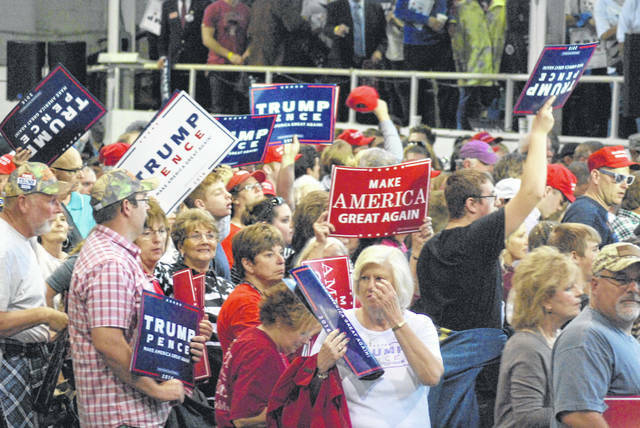 In October 2016, Donald Trump supporters packed the Delaware County Fairgrounds to see and hear from Trump, who at the time was the GOP nominee for president. 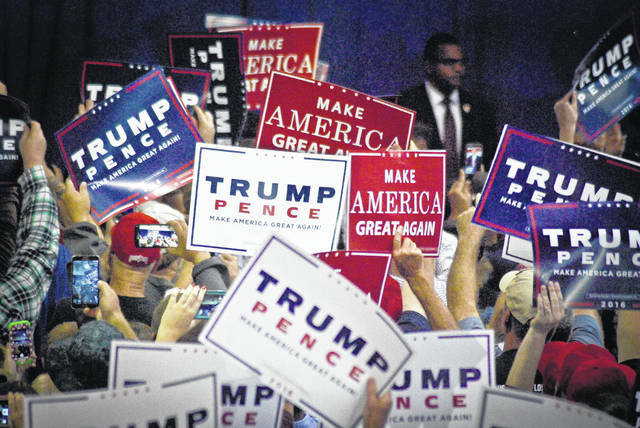 By Wednesday morning, news had spread throughout the county that President Donald Trump will once again campaign at the Delaware County Fairgrounds. The rally will take place at 6:30 p.m. on Saturday, Aug. 4 in the Coliseum. Pictured is Trump in an October 2016 file photo taken during his first visit to Delaware County as the GOP nominee for president. Saturday will be the first time Trump has visited the county as POTUS. President Donald Trump will visit the city of Delaware this weekend to show his support for Troy Balderson, the Republican candidate for Ohio’s 12th Congressional District seat. The Trump rally is scheduled to take place at 6:30 p.m. on Saturday, Aug. 4, in the Coliseum at the Delaware County Fairgrounds on Pennsylvania Avenue in Delaware. The personal appearance by the president will come just days before the Aug. 7 special election in which voters in the 12th Congressional District will decide which of three candidates in the race will serve the remainder of the unexpired term of Rep. Pat Tiberi, R-Genoa, that expires Jan. 3. Tiberi retired from Congress in January to accept the position as head of the Ohio Business Roundtable. Balderson’s opposition for the 12th Congressional District is Danny O’Connor, D-Columbus, and Joe Manchik, G-Reynoldsburg. Early voting began July 10 for the special election in the district, includes Delaware, Morrow and Licking counties, and parts of Franklin, Marion, Muskingum and Richland counties. In June, Balderson met with the Delaware County Republican Women’s Club at the Delaware County GOP Headquarters in downtown Delaware, where he said that he had seen the Monmouth University Poll showing that he had a 10-point lead over O’Conner. Democratic candidate for Pennsylvania’s 18th Congressional District, Conor Lamb, won the seat by a slim margin on March 13. On Wednesday, Delaware County Fair Manager Sandy Kuhn meet with the president’s security detail in preparation of his visit to the area. Kuhn had met in October 2016 with the U.S. Secret Service when Trump, the Republican candidate for president at the time, held one of his campaign rallies in the Coliseum at the fairgrounds. Kuhn said she told the Secret Service that the Coliseum holds approximately 1,500 people. “I know they are planning an overflow area,” she said. Other local GOP members made comments in anticipation of the president’s stop in Delaware County. Gebhardt said he was involved with the rally Thursday in Newark with Vice President Mike Pence and Balderson. This entry was tagged Campaign, D. Anthony Botkin, Delaware County Fairgrounds, Delaware County Ohio, donald trump, Karl Gebhardt, Ohio 12th Congressional District, Steve Cuckler, Troy Balderson. Bookmark the permalink.